Author Christopher R SmithPosted on September 9, 2018 Categories Suffering1 Comment on Why does God allow his people to suffer while worldly people prosper? Why couldn’t God just change things on his own? Q. Why couldn’t God just change things on his own? I mean, as powerful as he is to create the universe and mankind, living plants and mammals, I really don’t understand this part. Even though that post is written in response to a different question, it gets at the same issues you’re asking about. It explains that God created a world in which there was genuine moral freedom so that there could be the possibility of love. But at the same time, this freedom allowed for the possibility of destructive choices that would lead to suffering. Rather than act in all of His power to end that suffering (which would require taking away moral freedom), God chooses to work through the suffering to bring about His purposes in the end. He asks us to trust Him as he does this. And God Himself was willing to suffer, in the person of Jesus on the cross, setting an example for all of us to follow. Author Christopher R SmithPosted on March 24, 2018 March 25, 2018 Categories SufferingLeave a comment on Why couldn’t God just change things on his own? Does God not care about me being in pain? I am sorry but this is in regards to suicide. Specifically, will I be damned to hell if I have received Christ yet choose to take my own life? I am suffering from several physical ailments. I have been seeing doctors, going for tests etc, but nothing has helped or would help. I was even denied an operation. In short, I would have to be in physical pain constantly. The pain is killing me. I feel so tired of being in pain I am considering taking my own life. I have been praying to God, to take me home, or to take away the pain, but not much has happened in regards to that. The pain has resulted in the worst of me surfacing, I find it hard to be kind and patient to others. I also wonder why does God allow me to be in constant pain when He loves me. I believe in Him and His powers but I do not know if he is willing to heal me. Some times I feel that my well being is not of any priority to him as compared to His plans. I find that hard to accept. Like I (or my pain) am a tool, for him to use in His purpose. I really do not want to think like that. Are you able to shed some light on this so that I can stop thinking of God as some one who does not care about me being in pain? Thank you for your heartfelt questions. I do believe I can help you. My wife went through a similar experience of unrelenting suffering. She went home to heaven last year after suffering from ALS (Lou Gehrig’s disease) for 4 1/2 years. She basically spent the last six months of her life suffocating to death. This was so painful for me to watch that I literally got down on my knees every night before bed and begged God to take her home and end her suffering. She lived much longer than anyone expected and so had to endure a greater progression of symptoms than many patients do. At the end the only muscles she could move were in her face. But she was still using those muscles to smile. This was because, throughout her entire illness, we continually saw evidences that God loved her and cared very deeply about her suffering. I’ve written up our story in another blog entitled Endless Mercies. It begins with this post. The tag line to the blog is, “God’s mercies to you don’t end when you get an untreatable fatal disease.” We certainly found that to be true. My hope and prayer is that you would be encouraged by reading our story and that it would help you recognize in your own story the ways in which God has been showing how deeply he cares about you and your pain and suffering. But I believe this psalm was made part of Scripture in order to give a voice to situations like yours, where there is no sudden deliverance and we don’t find out in this life how it was all worthwhile. And because God has heard that voice and enshrined it within the Bible, we know that he does love and care for everyone in such a situation. I don’t want to presume anything about personal circumstances that I’m not familiar with, so forgive me if I’m off base here, but what I’m hearing from you is not really a question about suicide, but about meaning and purpose in life. I think what you’re really after is a reason to continue living, not necessarily permission to die. And as someone who has seen firsthand a situation of desperate, unrelenting suffering, I can testify that God’s personal love and care can be experienced in such a situation. May God open all of our eyes to see where and how his hand has been at work in our lives to help us. The purpose of your life is not somehow to display certain attributes of God’s character, or of Christian deportment, through uncomplaining suffering. You are not a “tool” in that way. The purpose of your life is to love and be loved, by God and by those closest to you. And I must say, from my own experience, that no amount of suffering can keep us from being loved by God and from loving God in return. No amount of suffering can keep us from receiving the love of those people who care for us and want to help us, and from loving them back. I believe that God has already placed some such people in your life. I pray that you will be able to recognize them and receive what they want to give you. When you do, you will be giving them a great gift in return. Author Christopher R SmithPosted on March 24, 2017 January 20, 2018 Categories Suffering3 Comments on Does God not care about me being in pain? Author Christopher R SmithPosted on February 27, 2017 January 20, 2018 Categories Suffering1 Comment on Wouldn’t the sufferings of people eternally separated from God outweigh the sufferings of Jesus on the cross? Why do some people seem to suffer more than others? Q. My question has to do with suffering and the fairness of God. Why do some people suffer, even terribly, while others do not? Judging from the stories of Job and Peter, Satan was given permission to cause suffering in their lives. It seems even worse that God would allow some people to suffer by this means. I’ll do my best to answer your question, although it’s one that people of faith have struggled with for all of human history without definitively resolving. Without freedom there can be no love. But freedom creates the possibility, perhaps even the likelihood, of suffering, as freedom can be, and is, misused. I believe that God knows, in a way that we cannot know, that a world with both love and suffering is infinitely better than a world with neither love nor suffering, and that those are the only two possibilities. Love is worth what has to be for it to be. But I don’t think this means that certain individuals are singled out for suffering. Every individual is liable to the possibility of suffering. But precisely because suffering is the result of freedom (misused), the “free” (undetermined) nature of the world means that some will likely suffer more than others. While the Bible does say that Satan specifically asked for and received permission to torment Job, and that Jesus warned Peter, “Satan demanded to have you, that he might sift you like wheat,” this is actually what Satan wants to do to everybody, with or without permission. If God granted permission in those two cases, it was because God knew He could bring a result out of the suffering that would advance His own purposes and defeat Satan’s—turning Satan’s own weapons against him. But this means that all of us must be willing to suffer if that will advance God’s purposes through our own lives. The difficulty is that we see such a small part of the big picture that usually we can’t understand why we are suffering. It feels pointless and useless. But God is trusting us to trust Him, that He indeed is at work in the situation (that He has chosen to work in it, given the nature of the world He created, not that He directly caused the suffering) to bring about a purpose that is so positive and redemptive, that in the end, when we do understand, we will rejoice in this work of God. Not that any of us should seek out situations of suffering. But we should know that, as Amy Carmichael often said, “The love of God is very courageous,” and that God will therefore trust us to accept difficult situations as a part of His plan that we will only understand in the end, when we can see everything clearly. Giaquinto, “Satan Before the Lord” c. 1750, Vatican Museum. 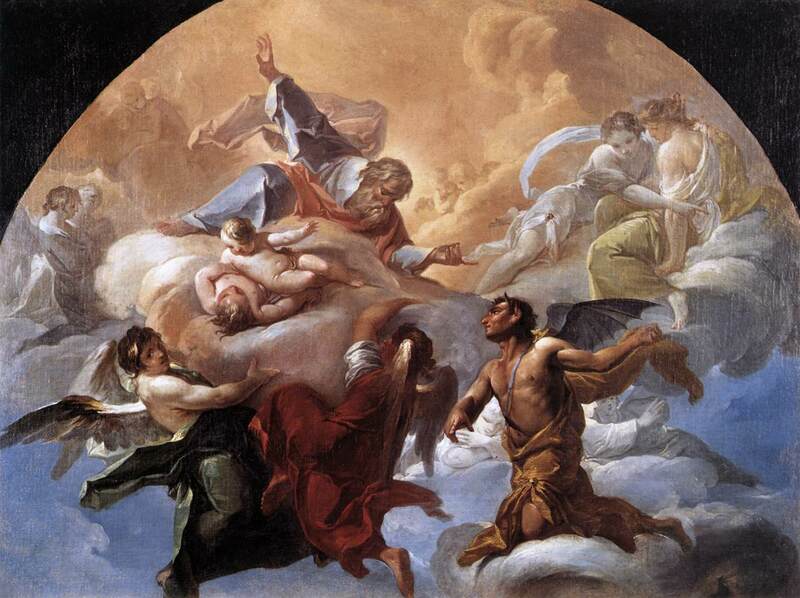 The painting depicts the scene from the book of Job in which Satan requests, and receives, permission to torment Job. Author Christopher R SmithPosted on June 3, 2016 January 20, 2018 Categories Suffering3 Comments on Why do some people seem to suffer more than others? Why doesn’t God intervene to relieve suffering? Q. If God is all-loving, why does God not intervene in times of great physical suffering when people are asking for his intervention? There is evidence that God can intervene and has done so in the past. You’re right, the Bible tells us about many times when God has intervened to relieve suffering—for example, on those occasions when Jesus healed every single sick person who came to him for help. Today when we pray for the sick and suffering, sometimes relief is granted, but not always, and we don’t really know why. We do know that God is always pleased when we pray for the sick and suffering because, as Jesus showed us, God has great compassion for them. (Jesus had such great compassion for Lazarus, for example, that he wept over his death, even though he was about to raise him from the dead!) So the problem isn’t that God isn’t loving. I think it’s helpful to recognize instead that God might answer us in different ways and still be glorified when we ask for His intervention (for example, when we pray for someone’s healing). Prayer is really all about seeking God’s glory and reputation, that these might be known and upheld throughout the world, even in the face of the mystery of suffering. God can be glorified when someone is healed or delivered. But God can also be glorified when someone shows great courage because of their faith, even though they continue to be sick or to suffer, and when the community of faith cares for them with loving compassion. Finally, God can also be glorified even if a person dies, if that person’s faith in God enables them to face death with strength and the hope of being with God forever. Recognizing all the different ways God can answer prayers (that is, requests that He intervene in situations of suffering) can take us some small way towards understanding the great mystery you’re asking about, which thoughtful people of faith have wondered about in all ages. But in the end I think this mystery is simply something that invites us to trust God, even though we don’t fully understand, as we seek to be His agents of compassion in this world, knowing that we are carrying out His loving and compassionate intentions as we do this. Author Christopher R SmithPosted on July 28, 2014 January 20, 2018 Categories Suffering2 Comments on Why doesn’t God intervene to relieve suffering?